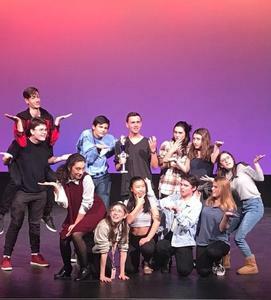 Congratulations to Westmont High School’s Thespian Troupe #2904 for taking first place in the California Thespian Northern Play Festival. The troupe won for their original adaptation of Molière's classic commedia dell'arte, "Scapin!" directed by senior Kyle Friedman, and choreographed by junior Vy-Na Nguyen. Ten high schools from across Northern California competed in the contest. The group will now travel and perform their play in front of the delegation at the California State Thespian Festival in Southern California in March. Good luck Westmont Thespians!